After a very long wait, here is a good news for all Adsense publishers who belongs to India, Because, Now Google Adsense has Finally started Payments via Wire Transfer in India. Google has made some big updates in its payment system, as they were working on this project to make their payments easy in India as well as other countries where Wire Transfer was not yet available. Wire Transfer is a very fast and easy way to get money directly into your bank account from foreign countries. In India, and other countries, there was no options available for Adsense publishers to get money directly into their bank account. Till now, Google used to send money via cheque’s in India and other countries where wire transfer was not available. Receiving money via cheque was very time consuming and it took up to 15 to 30 days to be clear. But now we can get our payments very fast directly into our bank accounts. 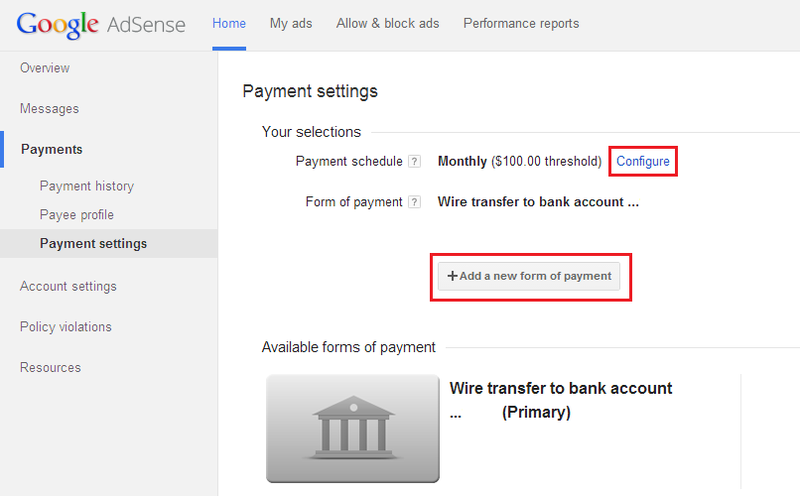 Here are some updates, that Google Adsense has made in Adsense payment. Your payment history page is now updated with some changes. Now you will get three option there. On your payee profile page, you can edit all your profile details like, your billing id, your tax details, your Address etc. On your Payment setting page you can choose your form of payments which is available, if you are from India then you will get only wire transfer option to get payments in India. You can also configure your minimum payment threshold, but it could not be minimum of $100. If you have received an Email from Google Adsense, saying that, your account has been upgraded to EFT (Electronic Fund Transfer) wire transfer payment, then its time to go to your Adsense account and add a new form of payment. To add a new form of payment just go to payment setting page and then, you will have to enter the following details there. That’s it, now just save your settings and hopefully you will get your next payment directly into your bank account. I know that there are so many publishers who were really looking for this big update, and now Google Adsense has finally made this to their Indian publishers. Google will not charge any Transfer Fee for making payments via wire transfer in India. But you can ask your bank for this, if they will charge any fee for this or not. Have you updated your form of payment? just do it now if you have received the Email, or let me know if you have any problem adding new wire transfer payment option.